The screw-on caps for many sealants do nothing to prevent the sealant from drying in the nozzle. I used to hate digging out the dried sealant. Not anymore. My co-worker told me to pack a quarter of the nozzle with lube. If no air gets to the sealant, it can’t dry out. When I need to use the sealant, I squeeze the tube until the lube comes out followed by fresh sealant. I like to use a teflon lube, but most any lube would do the trick. 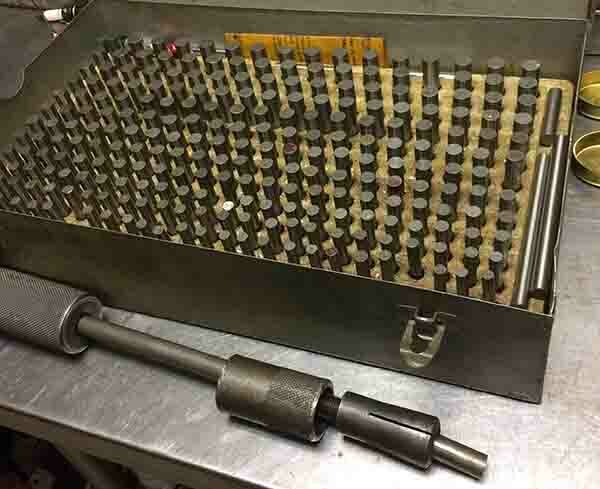 I picked up a Machinist’s Plug Gauge Set, in .250˝-.500˝ for scrap value, due to its age. But to me, it’s far from scrap. 1.) I use these as checking standards, or for setting a micrometer. 2.) They are a quick go-no-go method of gauging a precision hole, particularly valve guides. 3.) If it’s a real old set, they can be sacrificed for fabricating odd-sized dowel pins. 4.) I use them to remove a hollow/split dowel pin without damage. Find one that is a tight fit inside the dowel pin, then it can be removed with a collet-type dowel puller. Some cylinder heads, like small block Mopars, have the intake manifold bolt holes at a slight angle from the manifold flange. 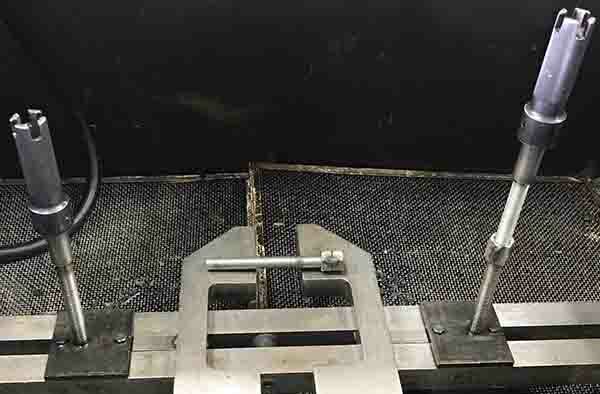 This makes it hard to mount on our surfacing machine milling plate because, when you tighten up the mounting studs against the plate, it wants to bend the stud. I took some 3/8˝ bar stock, drilled holes through it and then ground it into 10-degree wedges using my surface grinder. Now I install the wedges on the opposite side of the plate and it clamps down perfectly without bending the mounting studs. AMS Automotive Machine and Supply Inc. 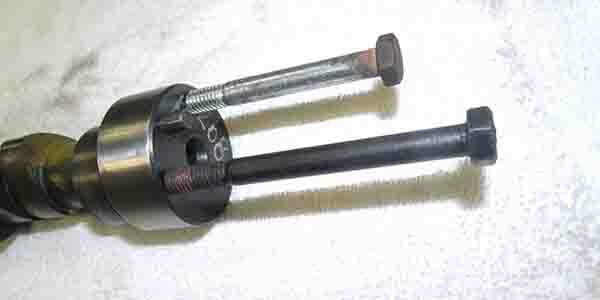 The early Gen III press-fit connecting rod was replaced by the Gen IV free-floating piston pin with rod bushings. 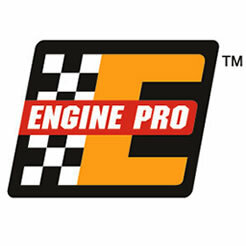 Some shops try to upgrade Gen III engines by substituting Gen IV pistons, and keeping the earlier rods. You need to be aware to USE the Gen IV retaining clips. GM reduced the Piston Pin diameter from .945˝ to .943˝. When using a later model (smaller) piston pin, it will actually slide in the pin end (assuming the rod is still in original spec). I’ve tried over 100 by hand, they can be stubborn to go in at first, which would lead some to believe it’s “still a press-fit rod,” but it’s just from normal oil and carbon build-up, as well as the near-perfect angle at which you have to insert a free-floating pin before it will go in. With a little patience and a bit of a clean-up, they slide right through almost every time. 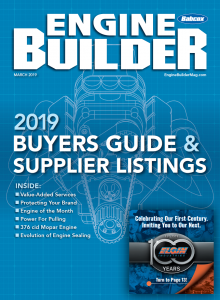 Simply put, when upgrading Gen III rods with Gen IV pistons, if you don’t use their retaining clips, the piston pins will slide out into the cylinder walls…very costly! Sometimes, the simplest thing can become the perfect tool. To properly install a camshaft doesn’t need an expensive special tool. A long bolt or two can make a great camshaft installation tool. Stack a pile of fender washers on your bolt for a comfortable handle on your Ford or Chrysler style cams, or just use a pair of bolts on something like a Chevy V8. This idea does relate to many other assembly procedures on engines and many other projects. By keeping long bolts on hand in your toolbox for these simple operations, you don’t have to buy specialty tools for a variety of procedures. Plus they take up less room in an already filled toolbox or select area of the shop.